I had so much fun recording this, laughing so hard at myself. I have never listened to myself speak and some of my friends used to say I sound razz speaking Yoruba but who cares,I love speaking my language. I miss speaking Yoruba daily, I only get to speak Yoruba when I am with my few Yoruba speaking Nigerian friends here... enjoy. In addition to the goat meat, I am tired of eating chicken and egg too...The egg, always comes with the chicken meal. The Ijebu blood runs in my vein, my mother is from Ijebu ode but my father is a Lagosian. I was born in Lagos and lived till the year 2010. My university, secondary and primary education were all in Lagos. Daughter of Abomire of Lagos from Isale Eko. 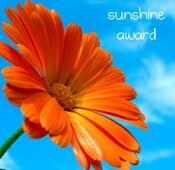 I would like to say thank you to Pet Projects for the Sunshine Award. I have been busy which is why I have not said thank you all these while, thank you very much. My friends and I in secondary school were called Ngbati ngbati girls because I was always speaking Yoruba. I don't see why I would speak English with someone I knows understands Yoruba. English is neither my father or mother's language. I am a Yoruba girl to the core, I love myself. I love eating amala and pounded yam, I cannot pound yam, neither can I make amala but these are my best foods with vegetable soup with different types of meat that we eat home. Like you already know, I am in India.Yesterday made it 7months since I have been away from home, leaving behind family and friends. I love my job and my new friends but I miss home. I miss my friends, my mum and siblings and I want to eat meat. I do not get to eat meat (cow meat) here. I never knew I would ever get tired of goat meat, I am tired of eating goat meat . I want to eat Panla (don't know the english name jor), beef, ponmo, all these I do not get to eat here, which is why I miss home so much. I want to thank you all for taking your time to read my blog, thank you very much and thanks to Sugabelly for the opportunity. "Abodi, panla.." lol | Abeg, dey speak english. Yoruba no fit u. ....thanks for stopping by, you tried o to live in mumbai but the experience sounds like FUN! I love traveling, really great for overall well being and opens ones mind when dealing with people. Loved, loved, loved it. My mum's Ijebu too, mo de feran lati ma je eba :). I couldnt find the track oh, but im dying to listen to your yoruba. Why are you claiming Ijebu more than Lagos na? Eyaaaaaaaa!!! I haven't eaten ponmo in a really long time and it makes me sad too. I really liked yours. I've added your entry to the Language Challenge page and linked to it. Thanks!! @LDP: I like my razzness jor...Omo Yoruba ni mi. @Adura: Amala, I can learn to make but that pounded yam level...I no dey. @PetProject: I am more in touch with my Ijebu blood ni oh. @Baroque: I need to eat meat and all those orishi rishi. Now that sounds like I was listening to news in Yoruba. Very fluent Lahrah! Well done!! Err how about those Yoruba lessons? This your yoruba is konk o, as in really good. LOL at ngbati ngbati girls..hahahah. secondary school days were so funny. I think this is the best Yoruba I've heard among bloggers. Goodness gracious...lahrah killed it and kee me!! but I enjoyed it,its not easy o! Maybe I should try this challenge too...Hmmmmm! LMAo! Just saw/listened to thsi for the first time...LMAO! BAbe, you try o!!!! Na whole story u speak in one breath bayen?! i hail o!